"Equipped with his five senses, man explores the universe around him and calls the adventure Science, wrote Edwin Hubble. "At the last dim horizon, we search among ghostly errors of observations for landmarks that are scarcely more substantial. The search will continue. The urge is older than history. It is not satisfied and it will not be oppressed. The history of astronomy is a history of receding horizons." Twenty-five years ago, NASA launched one of the most ambitious experiments in the history of astronomy: the Hubble Space Telescope, which has so radically changed and enlarged our picture and understanding of the cosmos and our place in it, is a cooperative project of NASA and ESA (European Space Agency), put into orbit in 1990 600 kilometers above the earth, allowing an unrivaled, undisturbed view into deep space. During the past several years alone, the Hubble has delivered a goldmine of discoveries: from the mapping of cosmic-web of dark matter, to rich tapestries of evolving deep-space galaxies, to the very dawn of galaxies using mankind's deepest optical view of the universe, to evidence for Dark Energy in the young universe from Hubble Ultra Deep Field, to compelling evidence of monster black holes at the centers of galaxies. Not by accident, the space-born telescope is named after one of the most fascinating men in the history of science. Born in 1889, ten years after Einstein (of whom he had little knowledge), few greats have had more effect on our knowledge of the cosmos than Edwin Hubble. A naturally-gifted track star, and scholar, the Missouri-born Hubble spent his life following a doctorate in astronomy from the University of Chicago answering two of the most fundamental and profound questions about our universe: how big is it, and how old? When Hubble moved to California in 1919 to take up a position at the Mount Wilson Observatory near Los Angles, little was know about the size and age of the universe. The number of known galaxies at the time he first looked out to the cosmos from Mt Wilson was exactly one: the Milky Way. The Milky Way was thought to embrace the entire cosmos with everything else, distant puffs of celestial gas. Hubble's ignorance of Einstein's General Theory of Relativity led to his nor being able to connect the dots between a universe that was expanding evenly in all directions (the "Hubble Constant") to a geometrical starting point, a "primeval atom, a Big Bang. That answer came several decades later with the discovery of cosmic background radiation from a hissing, constant, uniform low-frequency radio signal at a Bell Labs facility in rural New Jersey. 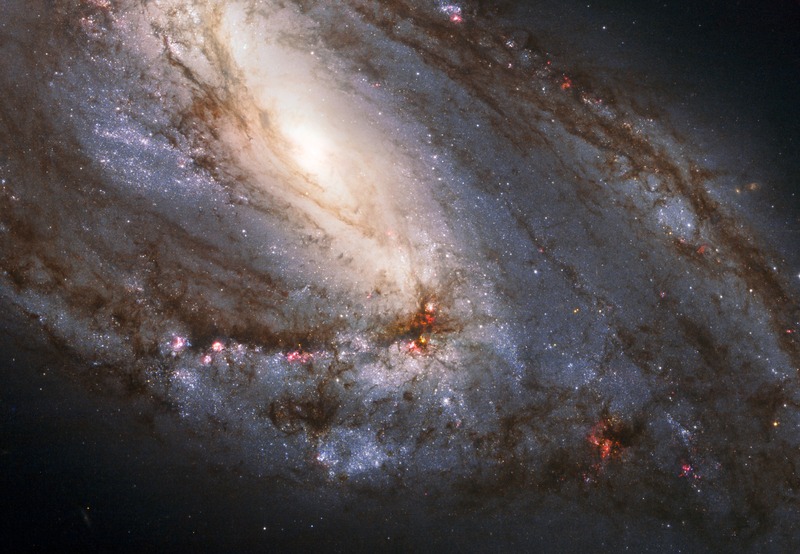 The Hubble image of beautiful spiral galaxy M66 lies a mere 35 million light-years away. About 100 thousand light-years across, the island universe is well known to astronomers as a member of the Leo Triplet of galaxies. In M66, pronounced dust lanes and young, blue star clusters sweep along spiral arms dotted with the tell-tale glow of pink star forming regions.The bright, spiky stars lie in the foreground, within our own Milky Way Galaxy, but many, small, distant background galaxies can be seen in the cosmic snapshot.